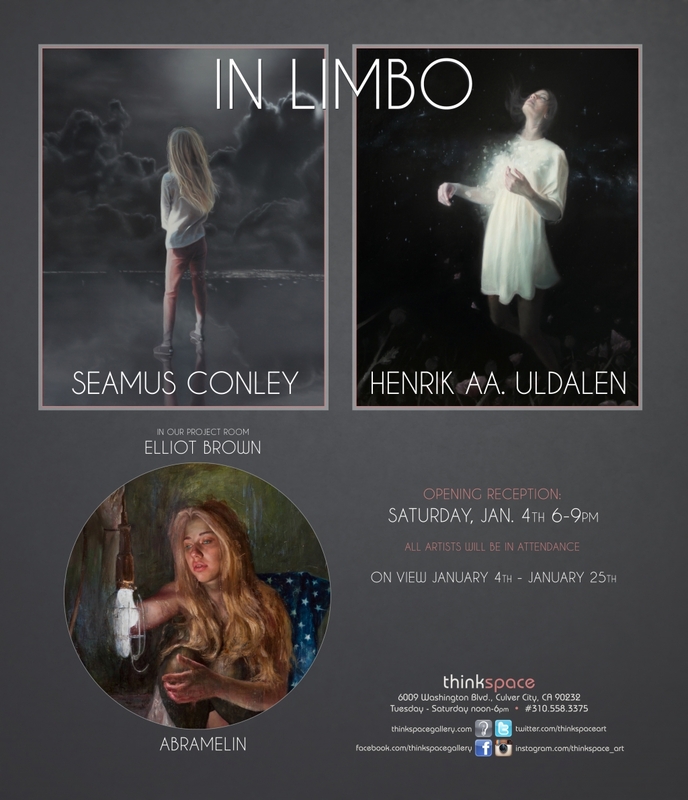 Thinkspace is pleased to present In Limbo, featuring new works by Henrik Aa. Uldalen and Seamus Conley. Both artists seek to capture a sense of liminal space in their atmospheric works. Decisively painterly, with elements of hyperrealism, their respective use of imagery is meditative and haunting, and just close enough to the “real” to be disarming. Both artists explore the threshold and the interstice as symbolic recurrences, seeking metaphysical and aesthetic resonance through unlikely juxtapositions of oppositional states: moments of stasis exist amidst movement, suspension looms in descent and interior and exterior spaces are ambiguously combined. While both artists incorporate aspects of photorealism into their painting styles neither would characterize their work as such, preferring rather to incorporate it as a means to express painterly ends. Uldalen and Conley’s entirely unique approach to painting relies on each’s stylization and thematic resolve. Presenting the viewer with emotive and surreal realities beyond the scope of the known, each unfolds a world of poetically sensitized space. Uldalen’s work is undeniably memorable, perfecting a unique combination of the apparitional and the tangible. Drawing from a cool Nordic and high contrasting palette, his atmospheric paintings range from the ethereal and icy to the tenebrous and shadowed. Uldalen’s ability to express ambiguous psychological states through figurative painting is unparalleled. In his works the body becomes an oblique metaphor for the psychological and the metaphysical; a vehicle for internal and external conflicts. The representational is mobilized poetically with an undeniable simplicity and resolve in Uldalen’s painting. Incorporating elements of the surreal through the spatial contexts in which his figures are rendered, but resisting the busyness of the obviously absurd or grotesque in favor of the economy of the stark, Uldalen creates relatable works that convey empathy and ambivalent poetry. The human body in space becomes the most salient metaphor for its psychic architecture. With prescience, Uldalen’s work seems to suggest an interest in revealing the thematic “threshold” in which existential moments become points of entry and simultaneous exit; they reveal the human and interminable process of making and undoing, of ongoing beginnings and ends. Technically clean and stylistically minimal, the works emphasize the coexistence of vulnerability and power, of wretchedness and euphoria, in the unresolved depths of the human psyche. Seamus Conley’s paintings combine elements of photorealism set against unexpected contexts and surreal situations. The environments in his works are drawn from fantasy and dream like states, probing the possibility of an aesthetic reality free from restraint and the confines of probability. Hauntingly beautiful, and uncannily poignant, the imagery borders on the post-apocalyptic at times given the surreal conflations to which the artist creatively resorts. The paintings are often cinematic in feeling and range from the whimsical to the terrifying. Conley’s interest in the inversion of expected relationships and the free association of juxtaposition contributes to the visual power and iconicity of his works. The imagery always seems to suggest the potential of narrative in a way that allows the viewer to project meaning and develop readings from the latent spaces and “in-between” moments staged. The work animates both spectral and embodied traces of the human through powerfully stirring recombinations of the familiar and the dissonant. We are left feeling as though we have seen this moment before, and yet also feel as though it is entirely new and unknown. This ability to harness both the familiar and the revelatory is at the heart of Conley’s beautifully saturated paintings.